The Benchmade Nimravus is one of Benchmade’s original knives that has stood the test of time and remains quite popular today. The knife has come in a variety of steels over the years including M2 tool steel, D2 and today, 154CM. The look of this knife is somewhat tactical, and somewhat futuristic. It resembles a dagger in some ways, especially the drop point version with it’s thin sharp blade, but has the handle of a utility or combat knife. When it comes to it’s intended use, I would lean towards a defensive knife or perhaps even an EDC option for those who live in more rural areas and can carry a larger fixed blade (there is a smaller Nimravus Cub that might be a little less intimidating). I could see this knife performing well in a kitchen or a campsite, and it could certainly open mail or handle other more pedestrian daily tasks. Today I will be putting this classic Benchmade fixed blade through it’s paces with the new black 154CM model with a ballistic nylon sheath. The Nimravus has a blade length of 4.5″, a total length of 9.45″, weighs 6.2 ounces, and is made in America. This is a lightweight knife with a nice narrow profile that gives it that stealthy dagger like look. Actually the name “Nimravus” comes from an ancient cat with really large teeth, which I think is quite fitting for this particular knife shape. The Nimravus comes in a tanto and drop point version; plain edge or partially serrated. I like the plain edge drop point and it has a flat grind that takes up about 3/4 of the blade. The steel Benchmade selected is the capable and thoroughly tested 154CM. 154CM is a great choice for this knife and it’s resistance to rust, edge retention and durability 3 of many reasons why Benchmade chose it for the Nimravus. In addition to the 154CM, Benchmade hit the entire steel with their tough BK1 black coating. This is a matte black coating that wears well – this is not some cheapo teflon coating you find on less expensive knives. That said, the coating will eventually wear and show signs of use. The Nimravus is a full tang knife that has two aluminum handle scales. The aluminum on today’s Nimravus is machined with an interesting ribbed pattern running along the length of it and is anodized matte black. The handle scales feel decent and provide some grip, although I honestly would prefer to see a more traditional design. Perhaps simple textured G10 scales that fit flush with the tang and are radiused on the edges to provide supreme comfort and grip. Call me old fashioned but that would appeal to me from a practical perspective. From an aesthetic perspective I think the current scales match the knife well, and this would be a cool knife for a collection in addition to being an extremely useful and potentially deadly tool. As far as other ergonomic features go, the Nimravus has plenty. There is a large choil carved out of the handle which works along with the deep jimping on the thumb ramp to provide excellent control over the knife. Also, the balance of this blade is superb with the weight hanging right over the choil. The knife feels quick and responsive and you can feel how it shifts in the hand. It’s a light and fantastic knife to wield and Benchmade has done an excellent job with ensuring the balance and utility of the knife remain high. As a final note, this full tang knife has a metal pommel with a lanyard loop. While it isn’t designed to be a glass breaker per se, this pommel could be used to break some glass or be used as a “non-lethal” way to disarm an attacker. It’s a nice touch that compliments the rest of the knife well. The Nimravus a sturdy nylon sheath with a kydex insert. The sheath offers several methods of attachment and you can remove various straps and connections to modify the knife as you like, however, I much prefer the optional kydex (hard plastic) sheath. As far as nylon sheathes go this one is top notch, but the durability of the kydex sheath is hard to beat. Keep in mind that it’s a $40 option, which may seem pricey but I assure you that it is money well spent if you are going to seriously carry this knife. In a perfect world I’d like to see this come with the knife. A final thing to note about the nylon sheath is that it comes MOLLE compatible. For those that use MOLLE (a system of attaching gear to yourself and your equipment) this is a nice feature that you don’t find with a lot of sheathes and it is worth taking a moment to mention. The Nimravus is a lightweight and capable knife that could fit the role of a large EDC or tactical blade. One thing that I may not have communicated through the review is the quality and level of fit and finish. This knife is well built. The blade is thinly ground, the balance is good, and the finish is everything you would expect from Benchmade. This is a durable blade and a convenient size to get real work done. It is lightweight enough to be a backup blade, but it’s got enough length on it that you could use it as a primary field knife or tactical option. For those seeking a piece of Benchmade history, or simply a good fixed blade knife, the Nimravus is well worth considering. 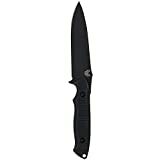 If you would like to buy a Benchmade Nimravus, I recommend purchasing it at Amazon.com or BladeHQ. Please consider that buying anything through any of the links on this website helps support BladeReviews.com, and keeps the site going. As always, any and all support is greatly appreciated. Thank you very much. I know this is a fairly old review, but I am looking for knives. You said ‘Today I will be putting this classic Benchmade fixed blade through it’s paces…’ yet I found zero information in the article about what those paces were now how this knife carves wood, cuts in general, makes feather sticks, batons, or does food prep? Also nothing about edge retention or sharpening. Hey Helmut, You know this review is very old and isn’t up to my standards. I no longer have a Nimravus on hand, so I ordered one. I’ll test it out again once it arrives and update the review. Hey Helmut, it’s a midsize fixed blade made of 154CM steel, why EVER would you want to baton wood with it? Get a hatchet. Feather sticks – again, it’s 154CM, properly sharpened with a proper edge, what do you think? And edge retention and sharpening ease? Oh, yeah, AGAIN – 154CM, any knife junkie would have already committed the pertinent properties of many steel grades to memory. Dan, great review, i have two, old style and new, and a Cub they are all great knives, I find I like the Cub the best for all around lite camp work, and the 140 for meal prep. I even prefer the Cub for game processing – easily controlled and no so much length so as to get in the way. Thx. for the reply, but pardon me for being a relative newbie to knives and steel and asking questions and reading reviews. When something states it gets put through its paces it is fairly normal to wonder what is has been put through and the results. I imagine others would want to know those details as well. This review and your reply gives none of that detail, so this can only be a general overview and not really considered a review. I have learned more since I read this article and have made my choice, and it is not a 154CM steel blade for my larger knife, although I do have a Benchmade folder in 154CM for EDC.